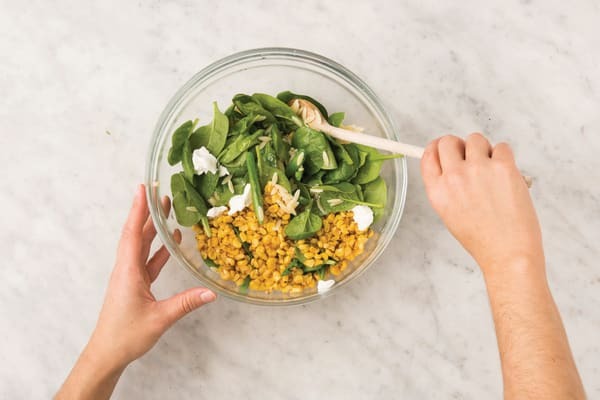 Risoni – the clever pasta that looks like rice – is the ideal ingredient in this dinnertime salad. 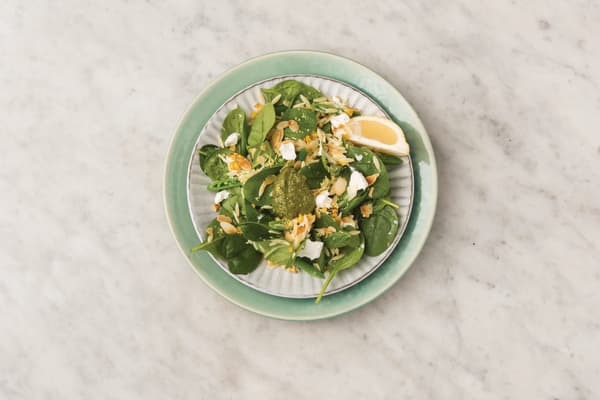 With baby spinach and sugar snap peas, this fresh bowl of goodness gets the welcome addition of goat cheese and pesto to really raise the flavour stakes. Bring a medium saucepan of salted water to the boil. Slice the corn kernels off the corn cob. TIP: Do this in a large bowl to stop the kernels from flying everywhere. 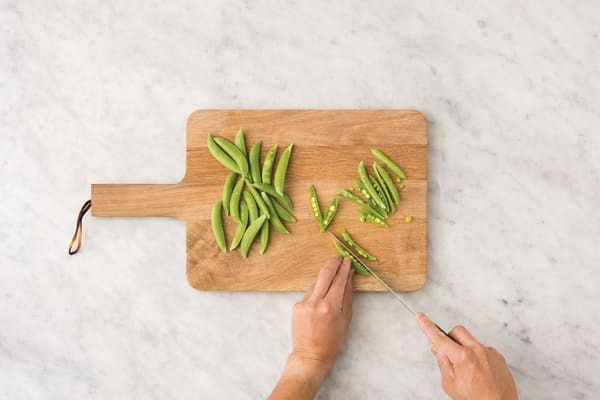 Trim the sugar snap peas and slice in half lengthways. Zest the lemon until you have a pinch, then slice into wedges. Add the risoni (see ingredients list) to the pan of boiling water and cook for 7-8 minutes, or until ‘al dente’. In the last 1 minute of cook time, add the sugar snap peas and cook until just tender. 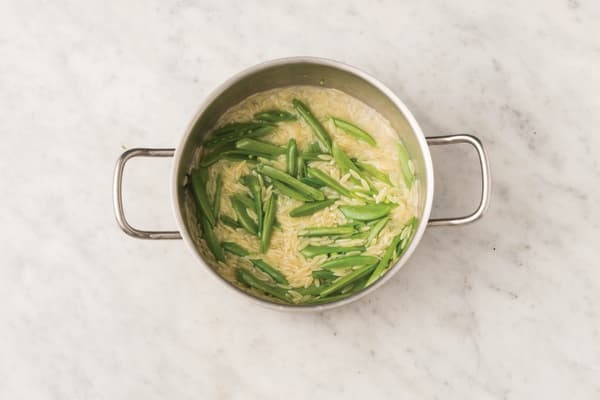 Drain the risoni and sugar snap peas together and rinse under cold water to stop the cooking process. While the risoni is cooking, heat a medium frying pan over a medium-high heat. 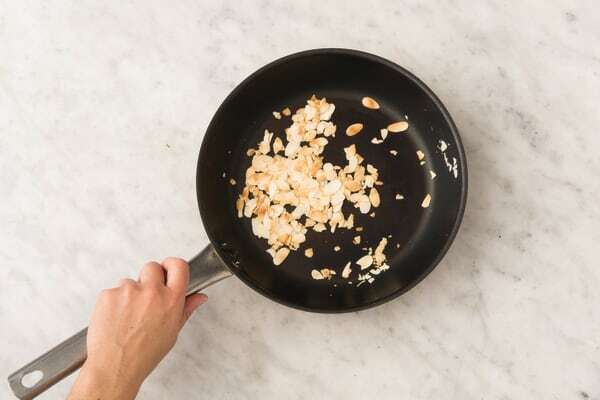 Add the flaked almonds and toast, tossing, for 2-3 minutes or until golden. Transfer to a small bowl. 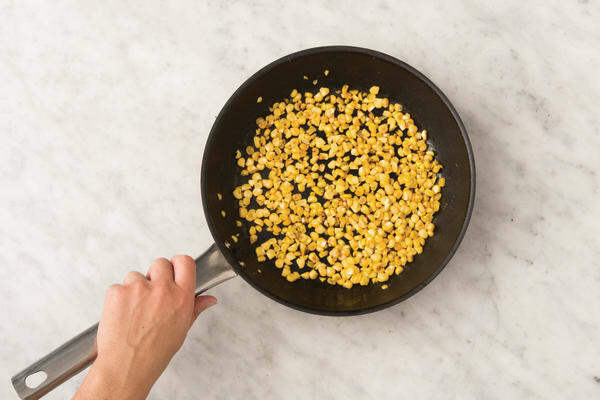 Return the frying pan to a high heat with a small drizzle of olive oil. Add the corn and cook, tossing occasionally, for 4-5 minutes or until golden and lightly charred. TIP: Cover with a lid to stop the kernels popping out. In a large bowl, combine olive oil (1 tbs for 2 people / 2 tbs for 4 people) with the lemon zest, a squeeze of lemon juice and a pinch of salt and pepper. Add the risoni, sugar snap peas, baby spinach leaves, charred corn and 1/2 the goat cheese. Toss to coat. 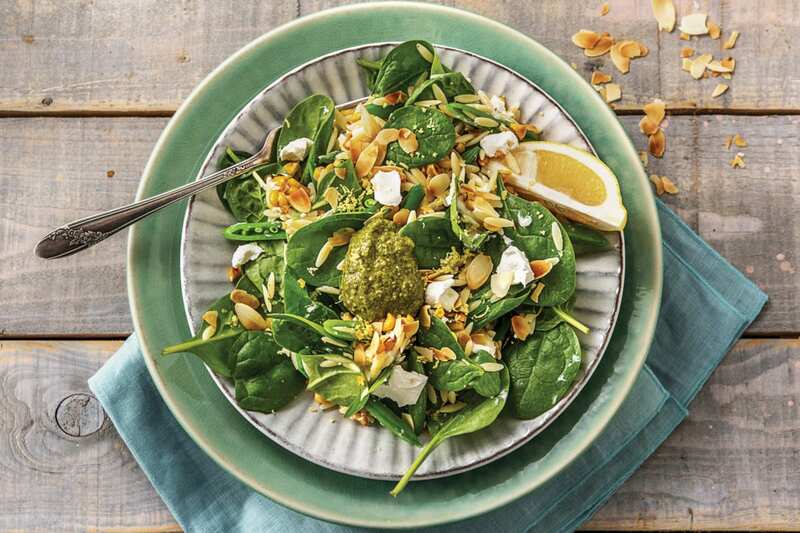 Divide the summer risoni salad between bowls and top with the flaked almonds, remaining goat cheese and a few dollops of traditional pesto. Serve with the remaining lemon wedges. TIP: Toss the salad with some of the pesto if you prefer.